This call is closed. Beta testing has been successfully completed. HealthCorrelator for Excel (HCE) is now publicly available for download and use on a free trial basis. For those users who decide to buy it after trying, licenses are available for individuals and organizations. To download a free trial version – as well as get the User Manual, view demo YouTube videos, and download and try sample datasets – visit the HealthCorrelator.com web site. Most human traits (e.g., body fat percentage, blood pressure, propensity toward depression) are influenced by our genes; some more than others. The vast majority of traits are also influenced by environmental factors, the “nurture” part of the “nature-nurture” equation. Very few traits are “innate”, such as blood type. This means that manipulating environmental factors, such as diet and lifestyle, can strongly influence how the traits are finally expressed in humans. But each individual tends to respond differently to diet and lifestyle changes, because each individual is unique in terms of his or her combination of “nature” and “nurture”. Even identical twins are different in that respect. When plotted, traits that are influenced by our genes are distributed along a bell-shaped curve. For example, a trait like body fat percentage, when measured in a population of 1000 individuals, will yield a distribution of values that will look like a bell-shaped distribution. This type of distribution is also known in statistics as a “normal” distribution. The reason is purely mathematical. A measurable trait, like body fat percentage, is usually influenced by several genes. (Sometimes individual genes have a very marked effect, as in genes that “switch on or off” other genes.) Those genes appear at random in a population, and their various combinations spread in response to selection pressures. Selection pressures usually cause a narrowing of the bell-shaped curve distributions of traits in populations. The genes interact with environmental influences, which also have a certain degree of randomness. The result is a massive combined randomness. It is this massive randomness that leads to the bell-curve distribution. The bell curve itself is not random at all, which is a fascinating aspect of this phenomenon. From “chaos” comes “order”. A bell curve is a well-defined curve that is associated with a function, the probability density function. The underlying mathematical reason for the bell shape is the central limit theorem. The genes are combined in different individuals as combinations of alleles, where each allele is a variation (or mutation) of a gene. An allele set, for genes in different locations of the human DNA, forms a particular allele combination, called a genotype. The alleles combine their effects, usually in an additive fashion, to influence a trait. Here is a simple illustration. Let us say one generates 1000 random variables, each storing 10 random values going from 0 to 1. Then the values stored in each of the 1000 random variables are added. This mimics the additive effect of 10 genes with random allele combinations. The result are numbers ranging from 1 to 10, in a population of 1000 individuals; each number is analogous to an allele combination. The resulting histogram, which plots the frequency of each allele combination (or genotype) in the population, is shown on the figure bellow. Each allele configuration will “push for” a particular trait range, making the trait distribution also have the same bell-shaped form. Studies of the effects of diet and exercise on health variables usually report their results in terms of average responses in a group of participants. Frequently two groups are used, one control and one treatment. For example, in a diet-related study the control group may follow the Standard American Diet, and the treatment group may follow a low carbohydrate diet. However, you are not the average person; the average person is an abstraction. Research on bell curve distributions tells us that there is about a 68 percentage chance that you will fall within a 1 standard deviation from the average, to the left or the right of the “middle” of the bell curve. Still, even a 0.5 standard deviation above the average is not the average. And, there is approximately a 32 percent chance that you will not be within the larger -1 to 1 standard deviation range. If this is the case, the average results reported may be close to irrelevant for you. Average results reported in studies are a good starting point for people who are similar to the studies’ participants. But you need to generate your own data, with the goal of “knowing yourself through numbers” by progressively analyzing it. This is akin to building a “numeric diary”. It is not exactly an “N=1” experiment, as some like to say, because you can generate multiple data points (e.g., N=200) on how your body alone responds to diet and lifestyle changes over time. I think I have finally been able to develop a software tool that can help people do that. I have been using it myself for years, initially as a prototype. You can see the results of my transformation on this post. The challenge for me was to generate a tool that was simple enough to use, and yet powerful enough to give people good insights on what is going on with their body. The software tool is called HealthCorrelator for Excel (HCE). It runs on Excel, and generates coefficients of association (correlations, which range from -1 to 1) among variables and graphs at the click of a button. This 5-minute YouTube video shows how the software works in general, and this 10-minute video goes into more detail on how the software can be used to manage a specific health variable. These two videos build on a very small sample dataset, and their focus is on HDL cholesterol management. Nevertheless, the software can be used in the management of just about any health-related variable – e.g., blood glucose, triglycerides, muscle strength, muscle mass, depression episodes etc. You have to enter data about yourself, and then the software will generate coefficients of association and graphs at the click of a button. As you can see from the videos above, it is very simple. The interpretation of the results is straightforward in most cases, and a bit more complicated in a smaller number of cases. Some results will probably surprise users, and their doctors. For example, a user who is a patient may be able to show to a doctor that, in the user’s specific case, a diet change influences a particular variable (e.g., triglycerides) much more strongly than a prescription drug or a supplement. More posts will be coming in the future on this blog about these and other related issues. The figure below, taken from Wilmore et al. (2007), is based on a classic 1972 study conducted by Ariel and Saville. The study demonstrated the existence of what is referred to in exercise physiology as the “placebo effect on muscular strength gains”. The study had two stages. In the first stage, fifteen male university athletes completed a 7-week strength training program. Gains in strength occurred during this period, but were generally small as these were trained athletes. In the second stage the same participants completed a 4-week strength training program, very much like the previous one (in the first stage). The difference was that some of them took placebos they believed to be anabolic steroids. Significantly greater gains in strength occurred during this second stage for those individuals, even though this stage was shorter in duration (4 weeks). 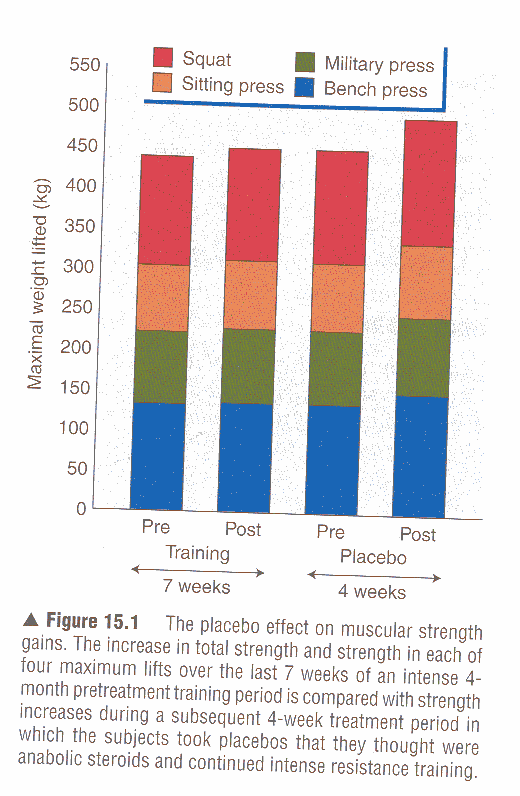 The participants in this classic study increased their strength gains due to one main reason. They strongly believed it would happen. Again, these were trained athletes; see the maximum weights lifted on the left, which are not in pounds but kilograms. For trained athletes, gains in strength are usually associated with gains in muscle mass. The gains may not look like much, and seem to be mostly in movements involving big muscle groups. Still, if you look carefully, you will notice that the bench press gain is of around 10-15 kg. This is a gain of 22-33 lbs, in a little less than one month! This classic study has several implications. One is that if someone tells you that a useless supplement will lead to gains from strength training, and you believe that, maybe the gains will indeed happen. This study also provides indirect evidence that “psyching yourself up” for each strength training session may indeed be very useful, as many serious bodybuilders do. It is also reasonable to infer from this study that if you believe that you will not achieve gains from strength training, that belief may become reality. As a side note, androgenic-anabolic steroids, better known as “anabolic steroids” or simply “steroids”, are synthetic derivatives of the hormone testosterone. Testosterone is present in males and females, but it is usually referred to as a male hormone because it is found in much higher concentrations in males than females. Steroids have many negative side effects, particularly when taken in large quantities and for long periods of time. They tend to work only when taken in doses above a certain threshold (Wilmore et al., 2007); results below that threshold may actually be placebo effects. The effective thresholds for steroids tend to be high enough to lead to negative health side effects for most people. Still, they are used by bodybuilders as an effective aid to muscle gain, because they do lead to significant muscle gain in high doses. Adding to the negative side effects, steroids do not usually prevent fat gain. Ariel, G., & Saville, W. (1972). 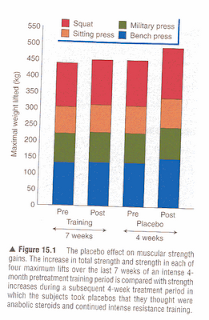 Anabolic steroids: The physiological effects of placebos. Medicine and Science in Sports and Exercise, 4(2), 124-126. As I said before on this blog, I am yet to be convinced that grilled meat is truly unhealthy in the absence of leaky gut problems. I am referring here to high heat cooking-induced Maillard reactions (browning) and the resulting advanced glycation endproducts (AGEs). Whenever you cook a food in high heat, to the point of browning it, you generate a Maillard reaction. Searing and roasting meat usually leads to that. Still, evidence that a person with an uncompromised gut can cause serum levels of AGEs to go up significantly by eating AGEs is weak, and evidence that any related serum AGE increases lead the average person to develop health problems is pretty much nonexistent. The human body can handle AGEs, as long as their concentration is not too high. We cannot forget that a healthy HbA1c in humans is about 5 percent; meaning that AGEs are created and dealt with by our bodies. A healthy HbA1c in humans is not 0 percent. This article is recent, and has already been cited by news agencies and bloggers as providing “definitive” evidence that high-heat cooking is bad for one’s health. Interestingly, quite a few of those citations are in connection with high-heat cooking of meat, which is not even the focus of the article. In fact, the Birlouez-Aragon et al. (2010) article provides no evidence that high-heat cooking of meat leads to AGEing in humans. If anything, the article points at the use of industrial vegetable oils for cooking as the main problem. And we know already that industrial vegetable oils are not healthy, whether you cook with them or drink them cold by the tablespoon. "The few human intervention trials […] that reported on health effects of dietary MRPs have all focused on patients with diabetes or renal failure." That is, there is no evidence from human studies that dietary AGEs cause health problems outside the context of preexisting conditions that themselves seem to be associated with endogenous AGE production. To that I would add that gut permeability may also be a problem, as in celiacs ingesting large amounts of AGEs. As you can see from the quote below, the authors decided to focus their investigation on a particular type of AGE, namely CML or carboxymethyllysine. "...we decided to specifically quantify CML, as a well-accepted MRP indicator ..."
As I noted in my comments under this post (the oven roasted pork tenderloin post), one particular type of diet seems to lead to high serum CML levels – a vegetarian diet. "... we conducted a randomized, crossover, intervention trial to clarify whether a habitual diet containing high-heat-treated foods, such as deep-fried potatoes, cookies, brown crusted bread, or fried meat, could promote risk factors of type 2 diabetes or cardiovascular diseases in healthy people." Well, “deep-fried potatoes” is a red flag, don’t you think? They don’t say what oil was used for deep-frying, but I bet it was not coconut or olive oil. Cheap industrial vegetable oils (corn, safflower etc.) are the ones normally used (and re-used) for deep-frying. This is in part because these oils are cheap, and in part because they have high “smoke points” (the temperature at which the oil begins to generate smoke). "The STD was prepared by using conventional techniques such as grilling, frying, and roasting and contained industrial food known to be highly cooked, such as extruded corn flakes, coffee, dry cookies, and well-baked bread with brown crust. In contrast, the STMD comprised some raw food and foods that were cooked with steam techniques only. In addition, convenience products were chosen according to the minimal process applied (ie, steamed corn flakes, tea, sponge cakes, and mildly baked bread) ..."
The STD diet was the one with high-heat preparation of foods; in the STMD diet the foods were all steam-cooked at relatively low temperatures. Clearly these diets were mostly of plant-based foods, and of the unhealthy kind! "... substantial differences in the plasma fatty acid profile with higher plasma concentrations of long-chain omega-3 fatty acids […] and lower concentrations of omega-6 fatty acids […] were analyzed in the STMD group compared with in the STD group." That is, the high-heat cooking group had higher plasma concentrations of omega-6 fats, which is what you would expect from a group consuming a large amount of industrial vegetable oils. One single tablespoon per day is already a large amount; these folks were probably consuming more than that. This study doesn’t even get close to indicting charred meat as a major source of serum AGEs. But it is not an exception among studies that many claim to do so. H Birlouez-Aragon, I., Saavedra, G., Tessier, F.J., Galinier, A., Ait-Ameur, L., Lacoste, F., Niamba, C.-N., Alt, N., Somoza, V., & Lecerf, J.-M. (2010). A diet based on high-heat-treated foods promotes risk factors for diabetes mellitus and cardiovascular diseases. The American Journal of Clinical Nutrition, 91(5), 1220-1226.